Help martins begin a colony in your yard with the Heath Deluxe Martin Gourd Kit with Pole. The classic configuration of the arms on the Heath Telescoping Gourd Pole Kit creates places to hang the eight included Heath Two-Piece Martin Gourds. The four over four design offers a dual-level look to the piece, while creating individual homes for your martins. These plastic gourds have a white color to keep them cool during the summer, and the crescent shaped entry hole prevents large birds from overtaking the nest. The bottom of the entry hole is perforated, to create a circular entrance if desired. Check these homes regularly by raising and lowering the telescoping pole, for a healthy martin colony. 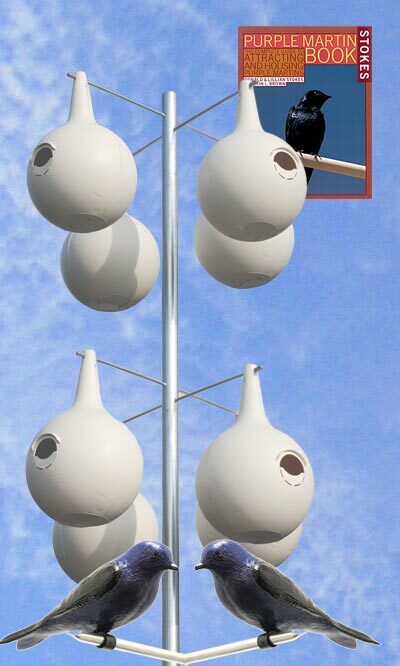 To further interest martins in the area, place the two included Heath Deluxe Purple Martin Decoys near the gourds. Refer to the included Stokes Purple Martin Book for answers to your martin questions. Help martins thrive in your area with this Deluxe Martin Gourd Kit with Pole, 4 Over 4. Assembly required. Heath Aluminum Gourd Replacement Hanging Rod, 20"